Last game pits me against another BREWS local. For the final battle it's capture the flag, with the flag & it's surrounding bog on the far side of a pond from me. 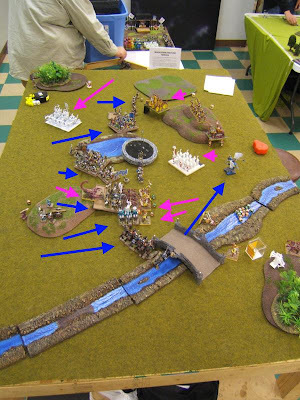 The TK have, from foreground (at the river) to background... 3 ushabti, tomb king plus chariots, tomb guard, casket on the edge of the hill, archers, skeleton warriors, and some chariots and the tomb prince on the far flank, behind the woods. (Trust me, those are woods.) 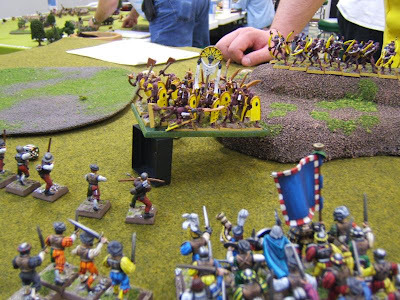 The scorpion that only looks like it is sitting on the bridge is actually somewhere below the surface, in the vicinity of the rear of the pikemen on the hill. 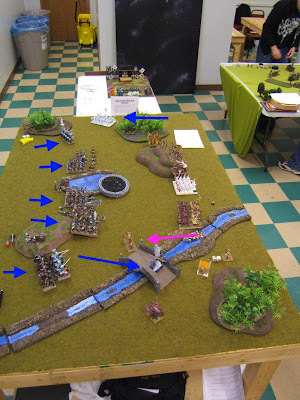 Marienburg had, from for to aft... pistoliers, knights, pegasus captain, cannon, pikemen on the hill, swordsmen, helblaster parked opposite the objective, more swordsmen, knights, and a cannon to hit the chariots as the filter through the bottleneck on the flank. Two turns in +/-. On the far flank the prince sacrifices his ride to save the chariot unit from the cannon. He then strolls into the woods and kills the crew. Knights move up to hold off the chariots. Everyone else moves forard. Even the helblaster, since the sissy undead are staying outside of range. The pistoliers run up, blast an ushabti, then flee behind the knights. They even rallied the following turn! First time all weekend they did what they're supposed to. Other than the distant chariots and the ushabti, the undead just sort of hang out, shoot a bit, cast a few incantations. Eventually the king and his chariots get off an incantation that gets them the charge into the pikemen. The "extra banner" on the pikemen is the fortune from my fortune cookie at lunch time. It says something like, "Your success will astonish everyone." After the first four games, I needed all the supportive talk I could get. Unfortunately, it was a big let down. The arch lector challenges, ends up locked in combat with the champion and can't wound him. The pikemen almost all hit. Then I throw a bucket of 1, 2, and 3s and only manage a single wound on the chariots. The chariots kill a few pikemen, mostly with impact hits. Undead lose by a little, but distribute the wounds efficiently. Over the next two turns the combat becomes a mess. 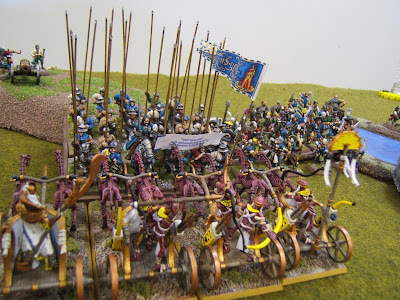 My knights charge the chariots flank. The ushabti charge the knights flank. The scorpion finally shows up (4th turn?) and charges the back of the pikemen, which pretty much seals their doom. I managed to kill two of the chariots, and get the king down to just a single wound. But I couldn't seal the deal. I broke and that was the end of it. The undead pursued into my cannons and the wizard skulking behind the hill. The swordsmen then had their flank exposed. In the distance, the chariots run over the knights like a speedbump. A very soft and shallow speedbump. The swordsmen on the far side of the pond are yet another let down. Even with a detachment swinging in on the flank (and quickly reduced to less than US5) they can barely manage to win combats against skeleton swordsmen. I think I killed like 2 of them by the end of the game... while the prince was slowly approaching from the woods. Maybe it's because they had the advantage of defending a hill. The game ended in yet another hideous defead for Marienburg. I finished somewhere in the bottom third of the standings. The only thing keeping me off the very bottom were the soft scores. My painting got me Best Painted, which came with a gift card. I used that to pay for the majority of a Fortified Manor terrain set, which I had been eyeying for the past year or so. Too bad the tournament wasn't a month later, otherwise I would have used it on Skaven! It's about time to go back to the army that is my true calling! Cheers for the reports Zero, and congrats on the Best Painted ;D Commiserations on the lower ranking, but I can only give you props for bringing out that beautiful and refreshingly low-powered army. 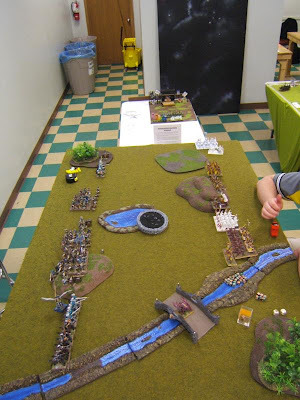 In all honesty, there were a lot of very reasonable armies at this tournament. Marauders (and Buckeye Battles, for that matter) actively encourage "soft" lists. Not to say all lists are equal, but mine wasn't exactly a sheep in a field of wolves.